“This was for the gentry.” We all looked down at what appeared to be a lidless coffin. “They didn’t want to get wet, so they were floated under this arch in this box. We’re not the gentry. You’re gonna get wet.” We walked to the end of the show cave, which terminated with a gate barring a steep descent through a mouth the size of a two elephants joined trunk to tail and extending far enough that we couldn’t illuminate the bottom with our headlamps. “Can you imagine this in flood? The water comes right up to this gate.” I tried to imagine it. How many aquariums would I have to drain to fill this hole? We opened the gate. My trip through England’s Peak District began with a day of spelunking through Peak Cavern (also know as Devil’s Arse), and our caving began with recreating the ride that Tom Baker took into the cave via a slide installed for the BBC’s production of The Silver Chair by C. S. Lewis. Not much further on, fantastical slides were forgotten as we stepped into our first pools. All year long, the caves stay around 45 F, and as water poured in over my wellies I wondered whether I would be able to tell if my body was warming up the water in my boots or if my feet were just losing feeling. I tried to remember temperatures and times for frostbite to develop. 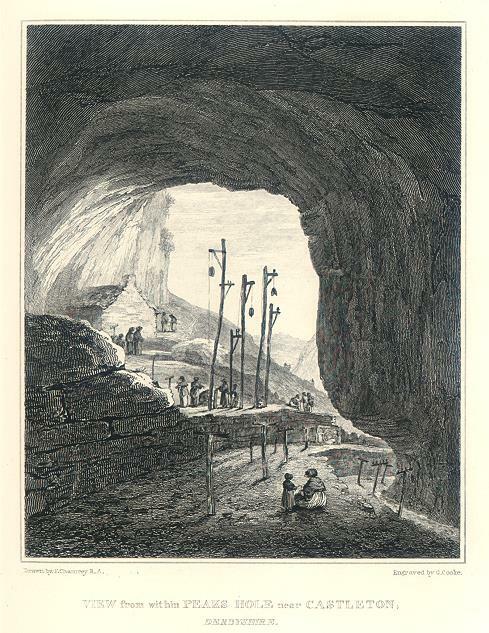 An engraving showing the entrance to Peak Cavern, where some of Britain’s last troglodytes lived until 1915, supporting themselves by selling rope and candles. But worries melted away in other wonders. Beneath my feet I found shallow fissures where it seemed like the passage had started to pull apart. Above me the cave roof opened up in to enormous avens, displaying different species of rock and mineral. We found fossils in the walls, chert among the boulders, and watched the slow creep of calcite from roof to floor. Our guide, Steve, helped us explore the geology and hydrology of the cave not just physically, but also with our imagination and intellect. Steve would say, “Well, 350 million years ago when this was all 2000 miles south of the tropics instead of this side…” in the way that I might say, “Well, when I used to live New York before moving here…” The cave system extends over 10 miles, weaving around the Speedwell Streamway. While the area has been inhabited and mined for a long time, it seems that documentation of the shafts and passageways was historically lacking. The system survey is far from complete, and many discoveries are still being made. Only 15 years ago, the largest shaft in Britain was discovered by a caver nicknamed Moose, who went digging with friends after a New Year’s Eve party based on an account from an 18th century clergyman. 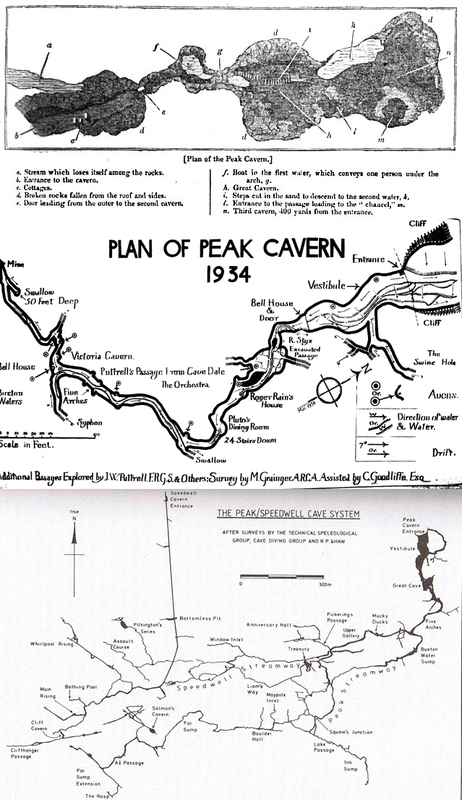 A comparison of surveys of Peak Cavern. The top survey (1834) appears to only show as far as the Great Cave, while the middle survey (1934) reaches as far as the Buxton Water Sump. The bottom (modern) survey shows the Speedwell Sreamway and interconnected cave system. Click for larger image. Just after wading through the Mucky Ducks, where the water is three feet deep and the ceiling perhaps just a foot higher, Steve handed me the cave survey. “Where do you think we are?” I looked at the feature just beyond the Mucky Ducks. “Razor Blade Aven?” “Is that a guess?” I looked up at the sharply split ceiling which rose perhaps five stories above our heads. “It seems like the right spot on the survey, and the name seems to fit.” “Okay, then take me to Pickering’s Passage.” Water dripped fell through the air and pinged on my hard hat. “Sure!” Staring down at the survey and looking at the bend up ahead, I announced that I’d found it – an opening high up the wall, just large enough for a large man to “comfortably” crawl through. Steve told us that at the end of the passage is the tomb of Neil Moss, a caver trapped in a tight corkscrew descending from a chamber which now bears his name. After Neil became stuck, a retrieval by rope failed after the weak hemp snapped three times, and build-up of CO2 from his own respiration caused him to asphyxiate. The incident was surprisingly recent, 1959, which underscores the degree to which modern equipment has enabled safe exploration of caves, and perhaps helps explain why so much remains to be discovered. This system posed significant challenges to early explorers simply because of how severe the flooding can be. There are passages which are continuously submerged and many more still with limited airspace even in the “extremely dry” conditions we encountered. One duck had just four inches of clearance between water and rock, requiring those brave members of our crew who ventured through to twist their head just to breathe. In fact, the bulk of our crew had attempted this expedition a month before, but had been flooded out by days of heavy storm. Cavers are cautious about flooding. Past Pickering’s Passage, we made our way to a capped sump, which serves as a telltale for flooding. The cap is reinforced with iron rods as thick as my forearm running into the rocks above, holding back the enormous pressure of the streamway beneath and forcing it to drain elsewhere in the system. Still, when the cave is flooding, water will bubble up through the cap, and regardless of the day’s ambitions, any expeditions need to evacuate. Water levels in other sumps and even the clarity of the water gives experienced cavers insight into risks. Steve showed us to an emergency shelter with rations, dry clothes, and candles where a trapped caver could stake out their survival while waiting a few days for the cave to drain behind them. A fixed rope ran from the floor to the roof of the chamber – Moose has been digging out a new passageway. The candles were for warming up the shelter, Steve told us, not as a backup for a busted headlamp. As a test we turned off our lamps. “How far do you think you could make it?” I had never before experienced darkness like this. It was literally darker than midnight on a moonless winter night. Even when I’ve been far enough away from light pollution to experience good darkness, the stars sneak in some light. Here there was nothing to see by. No matter how close a object came to your face, not a single stray photon was bouncing about the cave walls to help you find it. 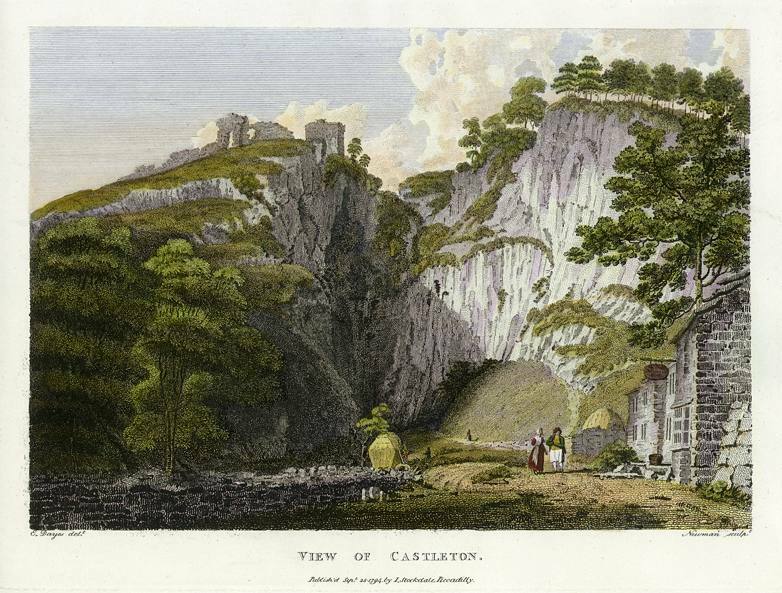 An illustration of the approach to Peak Cavern, with the ruins of Peveril Castle visible on the cliff top. Ricardo and I just after the Cadbury Crawl. Having finally lived out a long-held dream of mine, I’m eager to give caving another go. There’s so much to learn and discover, and it feels exhilarating to be bounding and sliding amongst the rocks and muck while trying to fathom where you are and how you got to be there, both in the immediate and geological sense. Steve (who works for Dolomite Training, by the way) did an amazing job welcoming us to the caving community, and with all I learned, I’d feel confident joining a club and having more adventures. And one day, I very much hope to do just that. 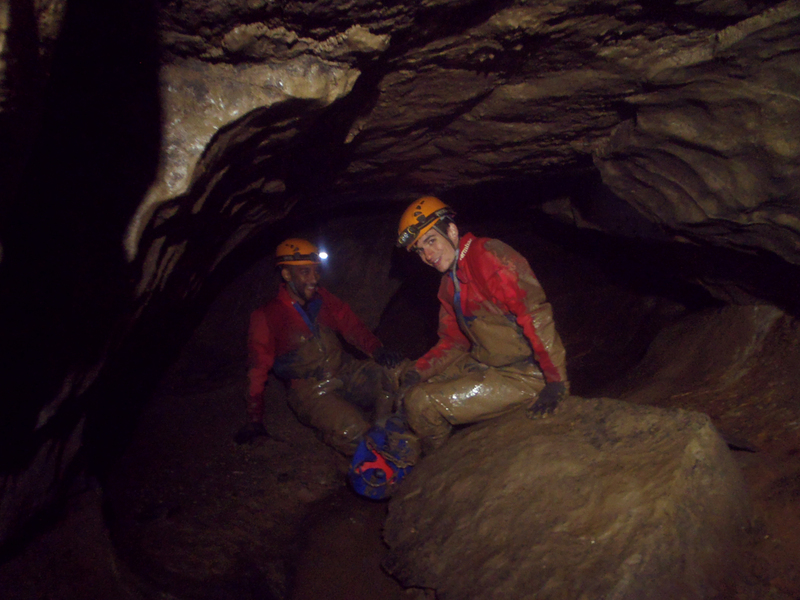 This entry was posted in travel and tagged caving, Derbyshire, Devil's Arse, geology, history, hydrology, narrative, Peak Cavern, Peak District, Speedwell, speleology, spelunking on July 17, 2014 by Dylan Bargteil.